Feeding in Velvet Mesquite (Prosopis velutina), at Organ Pipe Cactus National Monument, Arizona, USA, May 2013. These large arboreal crickets are perfectly shaded and marked for hiding within the scramble of twigs and foliage of desert trees and shrubs. Well, almost perfect, birds work to decipher the camouflage and catch them anyway. With powerful mandibles katydids chew the leaves and buds of their host plant. Movements are largely nocturnal and this is when the males make stridulating calls. 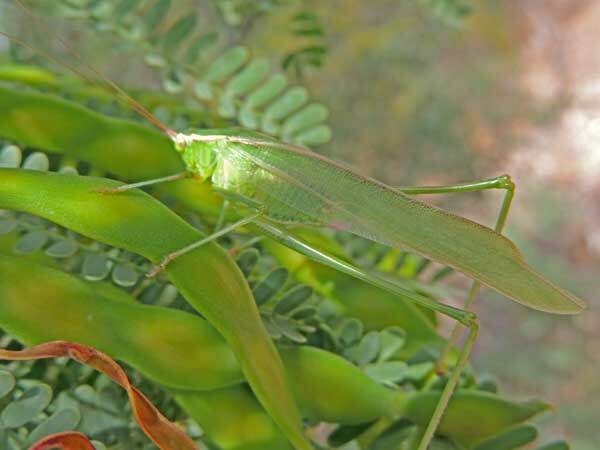 There are several similar species of thread-legged katydids each with their own distinctive calls.